Sept. 11, 2015, 2:52 p.m.
By Shan Wang @shansquared Sept. 11, 2015, 2:52 p.m. Settling on a sustainable strategy for online video has been notoriously difficult for publishers. Efforts to produce live video shows have mostly sputtered. The Washington Post is now betting on “the right stories for the right platform at the right time,” according to its video director Micah Gelman, hired by The Post in April. (He was previously director of digital video strategy and operations at Discovery). The Post’s PostTV launched in 2013 with lofty promises to be the “ESPN of politics,” but it lost steam and eventually became a repository for wire content and press briefing footage. Its new efforts, rebranded as Washington Post Video, will extend its investment in video, customizing content for various different platforms and turning away from some longform shows in favor of pointed, shorter clips. It’s making a big hiring push for new video editors — including some to work with Post “franchises” like Wonkblog and The Fix — and plans to integrate video reporters and editors into the Post’s many section teams when the paper moves offices at the end of the year. The “appointment viewing” days of PostTV, Gelman says, are over. The success of a video often depends on the context in which viewers are watching it. The Post intends to keep tweaking content to best fit different platforms — whether it’s the same type of content told slightly differently, or creating slightly different versions of a video —working in coordination with its audience development team. 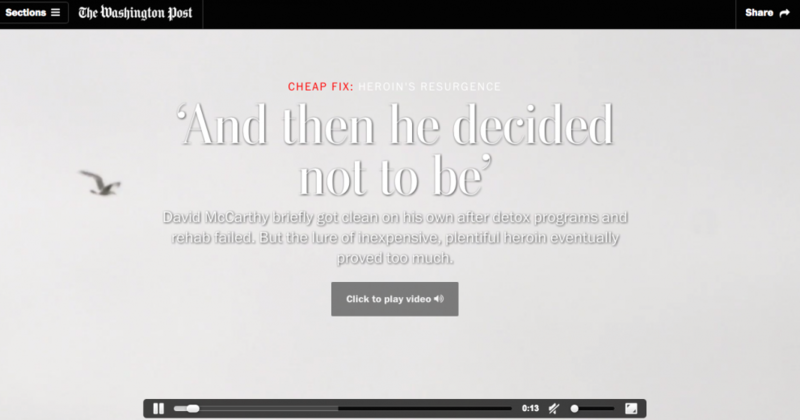 He pointed to a video done for a story in The Post’s series on the rise of heroin, in which the video was embedded right at the top of the story. The Post is also looking into more nascent technologies like virtual reality and 360-degree video, which it has already experimented with internally. According to Gelman, 360 video will be a “really critical piece of our campaign coverage.” As an example, he suggests that with a full 360 video, viewers can experience what it’s really like to be on the campaign trail by seeing not just the candidates but what the candidates themselves are seeing. POSTED Sept. 11, 2015, 2:52 p.m.
Wang, Shan. "In revamping its video strategy, The Washington Post steers clear of imitating TV." Nieman Journalism Lab. Nieman Foundation for Journalism at Harvard, 11 Sep. 2015. Web. 18 Apr. 2019. Wang, Shan. "In revamping its video strategy, The Washington Post steers clear of imitating TV." Nieman Journalism Lab. Last modified September 11, 2015. Accessed April 18, 2019. https://www.niemanlab.org/2015/09/in-revamping-its-video-strategy-the-washington-post-steers-clear-of-imitating-tv/.